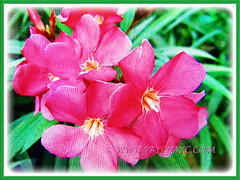 Nerium oleander produces blossoms of numerous magnificent colours. Nonetheless, it is one of the most poisonous garden plants. 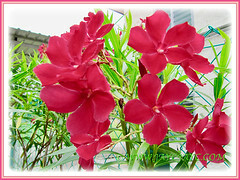 Oleander is the official flower of the city of Hiroshima as it was the first to bloom after the atomic bombing in 1945. 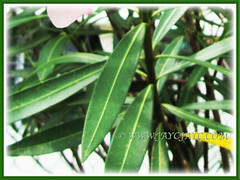 Botanical Name: Nerium oleander (syn. 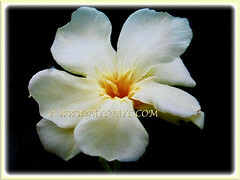 : Nerium carneum, Nerium flavescens, Nerium frandiflorum). 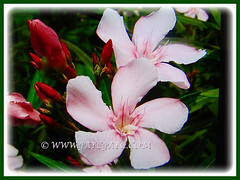 Common Names: Rosebay, Nerium, Oleander. Etymology: The genus name, Nerium is from the classical Greek name. 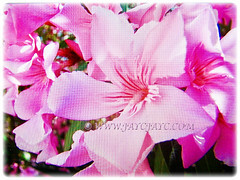 The specific epithet oleander is from the Italian oleandro for its olive-like leaves. Origin: Native to Southwest Asia including the Mediterranean regions. It is naturalized and cultivated worldwide. Plant type: An ornamental shrub or small tree. 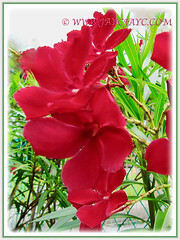 Features: Nerium oleander is from the genus Nerium that consist of only 1 accepted species of flowering plants. 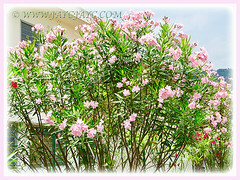 An upright and bushy shrub or small tree, Oleander grows to 2–6 m tall, with erect stems that thrust outward as they mature. During the first year, the stems are dull greyish-green in colour coloured and when mature the stems have a grey bark. The dark green and glossy leaves are in pairs or whorls of three, thick and leathery. Each leaf, measuring 5–21 cm long and 1–3.5 cm broad is narrow and linear-lanceolate with a distinctive midrib. Leaves are arranged oppositely along the stems. The 2.5-5 cm diameter flowers grow in clusters at the end of each branch. The mildly scented flowers are five-petaled and funnel-shaped. The showy flowers can be single-petaled or double-petaled. They come in variable colours and sizes. The colours are normally pink and red. However, cultivars come in other impressive colours that include white, cream, lilac, apricot, yellow and purple. Sizes can be dwarf, medium-height or large. Eventually, the flowers will be followed by a fruit that is a long narrow capsule 5–23 cm in length which splits open at maturity to release numerous downy seeds. 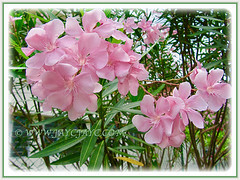 Culture (Care): Nerium oleander can be easily grown with minimum care. Light: Best in full sun for optimum growth and flowering. Plants in semi-shade will produce flowers but less profusely. Moisture: Medium water needs. Water regularly but allow soils to dry out between waterings. It is drought-tolerant once established and is resistant to salty sea winds. Others: Promptly deadhead spent flowers to prevent formation of non-ornamental seed pods. Prune occasionally to prevent legginess and to maintain a pretty bushy shape with more branches that will result in more flower clusters. Established plants do not need feeding. Nonetheless, they do benefit from a monthly fertilising to stimulate growth rate and production of flowers. Take note: all parts of the plant is toxic and latex can irritate skin and cause allergies. Generally free from serious disease or insect problems. However, watch out for mealybugs, spider mites, aphids, scale and caterpillars. Caterpillars of the Daphnis nerii (Oleander Hawk-moth) can devour a whole Oleander shrub of young leaves and flowers in a short time. 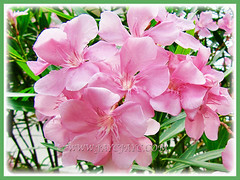 Nerium oleander is planted in many subtropical and tropical areas of the world. Since it can tolerate some frost, leave the container outside in fall until temps dip below -6.67°C and return it to a protected outdoor as soon as temps allow in spring. In non-hardy regions, best to grow it in a container/tub to overwinter indoors or as year-round houseplants. A seasonal bloomer that is deer resistant. Propagation: By tip cuttings or semi-hard and hard wood cuttings. Usage: Nerium oleander or Rosebay, with its ornamental flowers will be excellent as an attractive accent in any landscape or cityscape. These beautiful shrubs are suited to be planted on median strips. An ideal container plant for sunny decks, patios and other areas around the house. Also, it can be used to create a dense hedge or screen for some privacy.